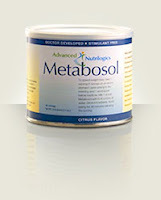 We've gotten several requests for reviews of Metabosol , a new weight loss supplement from low-carb experts Drs. Michael and Mary Eades. No one here has used it yet and we haven't even been able to find any real customer reviews or testimonials, other than the obviously-biased ones on the web site. According to the Eadeses the new Metabosol product is a proprietary blend of several safe nutrients that is designed to speed up the weight loss process when combined with a healthy diet and good exercise program. So... nothing too new or extraordinary there! It took me a fairly long while to find the active ingredients in the Metabosol formula but eventually I found them. They include: carnitine, hydroxycitrate, chromium, aspartic acid, and biotin... in "specific doses designed to support fat burning, especially if taken while on a moderately low-carbohydrate, protein-rich diet". Again, nothing too "special" there. All of those ingredients can be found in countless other diet supplements and none of them have yet been scientifically proven to significantly speed up fat loss. Of course, the combination and "specific" ratio may hold the key to fast and easy weight loss... and that's exactly what this product is trying to imply. Apparently Metabosol is a powder that you mix with plain water. Powders are usually better than pills, but only if the flavor is OK. Currently this product only comes in two flavors -- Berry and Citrus -- so it will be interesting to get some user reviews regarding the taste. The Eadeses are true experts who are well respected in the fitness community. But in recent years they have kind of gotten a reputation for promoting some "iffy" products (like Pentabosol) and sometimes seeming to be more interested in selling books and products than in actually helping people lose weight in a healthy way. That being said, Metabosol may work very, very well! We'd love to hear any reviews, opinions, comments, or questions regarding this product. If you'd like to leave your own, just do so in the area below. Thank you!! Hi I'm a new low-carber who's looking for something to help me. I need to lose about 40 pounds and am wondering if Metabosol really works or not. I really don't want to buy something and end up just spending/wasting my money on another rip-off product that doesn't work! So, will this stuff help me lose weight or is it just another diet supplement scam?? I'm a fan of Michael Eades. I've read all of his books and trust just about everything he says. I've even used the ImmunoPro protein powder he sells and was very happy with the results. I'm sure that he and his wife Mary Dan would only recommend good stuff so I definitely plan on trying this new supplement. It is a little pricey but I'll look at is as an investment in my health and happiness! I started using Metabosol a few days ago.. still haven't noticed a big difference but I'll give it another 2 or 3 weeks! Just thought I'd pass on that Dr. Eades, on the ProteinPower website, says that Metabosol is basically Pentabosol reformulated with natural sweeteners. If you do some research on Pentabosol reviews by users, you will probably be able to put together a picture of the product for yourself.